Celebrating the rollout of the donation to the Newark Schools that accomplished nothing. A long-form report just published in the New Yorker caught my attention. 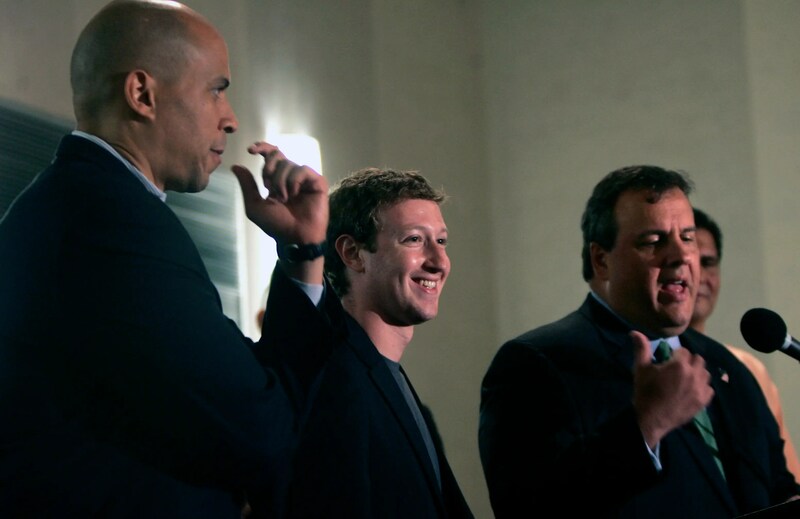 Five years ago, then- Newark Mayor Cory Booker persuaded Mark Zuckerberg (mister FaceBook) to donate $100 M to improving the schools of the city of Newark NJ. There were a number of conditions put on the money, but the upshot was that Booker and Zuckerberg wanted to turn one of the lowest-performing school systems in the United States into what Zuckerberg called “a symbol of educational excellence for the whole nation,” spent on retaining the best teachers, and creating environments that would produce successful students and, one day, graduates. Booker has been an outspoken advocate for the Charter schools movement and for generally tipping over the educational status quo. That means (among other things) the end of teacher tenure, the removal of teacher seniority as criteria for raises, merit-based teacher pay, and principals and administrators getting a freer hand in the decision that govern their schools. It has been a powerful wedge issue that splits the ordinarily Democrat-leaning teachers’ unions from supporting the Democrats. It’s also an issue where ‘centrist’ Democrats are colluding with Republican colleagues to make the changes. I have no stakes in this fight. I don’t have kids, and I don’t work for anybody’s school system. The results of this experiment were thought to have long-term ramifications for the way we manage our educational systems here in the US, which everybody admits are failing. Long story short: five years and $100 million later (probably more, as Zuckerberg wanted his donations to be matched by other philanthropists) and there has been very little net change in student achievement in Newark. The details of the debacle are here in the New Yorker. If your time is valuable, there’s a short-form here. Can we all agree that the next time somebody gets a pot of money to transform urban schools, the LAST person the lucky school system (or its political leadership) should hire is someone from the US? Many of the people hired for this rollout were alumni of the Edison project or other educational privatization schemes. They are too used to seeing answers through the ideological filter that came with their former jobs. I’d suggest we drop the high-priced consultant money into bringing education leaders over from the countries where they’re eating our lunch (South Korea, Finland, New Zealand, Canada). Let them see our schools in the context of the lives of the students. There are financial consequences for a nation that has under-performing schools. In 2005, Toyota decided to locate its RAV4 plant in Canada instead of Alabama, even though Canada offered no sweeteners. While the primary factor in the decision was healthcare costs (which were controlled under Canada’s single-payer system), it was no small thing that Toyota Managers felt that Canadian workers were better educated and more prepared to enter the workforce than their American counterparts. Read it here (it’s a Paul Krugman column). One more thing they aren’t doing in the nations where school systems excel. They aren’t re-running the Scopes trial. They aren’t rewriting their history textbooks to soothe the feelings of students in former slave states. They aren’t having stupid fights over curriculum about global warming. We have examples of working schools systems. But most of them aren’t inside our borders. As for charter schools, I had written about the problems here. One of the untold stories of the last decade was just how badly former mayor Michael Bloomberg did at running the school system. He was also big on charters and attacking the teachers’ unions, but his results are even more shocking when one considers just how much control of the school system he was given. One hundred million dollars to prove that the reforms don’t work. Most of my NY Teacher friends could have explained the problems and saved Booker and Zuckerberg the embarrassment. ← How come there are no pot holes in the Netherlands?